Manchester United set to pay £36million for Nicolas Otamendi Manchester United are coming closer in their pursuit for Valencia defender Nicolas Otamendi, according to The Independent. 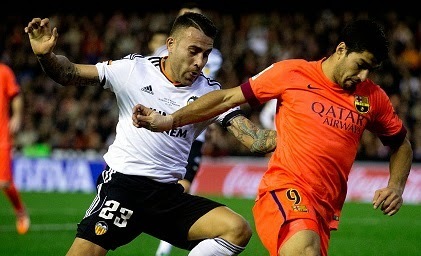 Manchester United are coming closer in their pursuit for Valencia defender Nicolas Otamendi, according to The Independent. Manchester United boss Louis van Gaal is now focusing on the transfer window as the Premier League has now ended. The Dutch boss is now planning to splash £36 million for Nicolas Otamendi to seal his summer move from Valencia. The 27-year-old right-back had his best season which ended yesterday. He was the regular player for the Spanish side, scored six goals in 35 games in La Liga. Otamendi played more than 120 games for Porto before joining Valencia in 2013 for a fee around €12 million, the player is now valued around €40 million. Man Untied are also planning to offer full-back Antonio Valencia side who has been eyed by the La Liga outfit in the recent weeks. The Red Devils may also have to sign a backup right-back as Rafael is also likely to leave the club this summer. While, Borussia Dortmund defender Mats Hummels who was also linked with a move to Manchester United will now not be on Man United’s radar due to the delay in his deal from the German side. Meanwhile, United are also keeping tabs on Tottenham Hotspurs goalkeeper Hugo Lloris who is set to leave White Hart Lane.